All these plans are separated by cost, capability, and some miscellaneous details, such as what kind of support each plan will receive. But if you’re a marketer, and it’s your job to market the product with these plans, how do you know which one delivers the best ROI? Or which plan leads to the highest churn rate? Does the small plan have the best ROI? Or is it the enterprise? And which plan has the highest cancellation rate? The Kissmetrics Revenue Report can help you answer all these questions. Viewed as a whole, your revenue is like traffic. It’s just one (hopefully, big) number. If you don’t segment (or, put another way, group) it, you won’t know who is sending you revenue, which segments are the most valuable, etc. The Revenue Report allows you to segment your revenue, which can deliver important insights. Let’s see how. Here we’re segmenting revenue by subscription plan type (small, medium, enterprise). So all the customers who are in the small plan are put in the small segment, medium are in the medium segment, etc. Since freemium doesn’t deliver any revenue, it is not included in the Revenue Report. We have 5 metrics for each segment. Total Revenue is the total amount of revenue that has been received for that segment. Average Revenue/Person is the average amount of revenue we’ve received from each customer in that segment. It’s simply the total revenue divided by the number of paying customers. Lifetime Value is the estimated amount of revenue we can expect to receive from each customer in each segment. It’s a calculation of average revenue/person divided by churn rate. Paying Customers is the number of “active” customers. These are the people we have recorded revenue from who have not churned. Total Churn is the cancellation rate, or the percentage of customers who stopped paying. We can see that our medium plan is the segment with the largest revenue. It sends us the most revenue, has the most customers, and has a solid lifetime value. The only downside is its fairly high churn rate. The small plan is causing problems for our business. While it brings a lot of revenue, it has a high churn rate. We’ll need to investigate ASAP to determine why 15% of the customers in this plan end up canceling. The enterprise plan excels in nearly every category. While it doesn’t bring us the most revenue, it does have a low churn rate, the highest average revenue/person, and a great lifetime value. Given this data, we should invest more effort in getting customers into our enterprise plan. Kissmetrics reports allow marketers to make data-informed decisions that help guide growth. Let’s see what actions we can take based off the data above. The first step is to identify why so many customers in the small plan are canceling. If we don’t already request a reason for cancellation when a customer cancels, we should set that up. If this doesn’t provide any good intel, we can go back to look at the support tickets those customers submitted to see if we can find patterns in the troubles they had. We’ll need to do some math (if we haven’t already) and figure out what we’re spending to acquire a customer. We can come up with a rough number by dividing the sum of all sales and marketing expenses by the number of new customers added (David Skok has more on this). The general rule is that “lifetime value” should be at least 3x the cost to acquire a customer. If we have a freemium plan, we can use the Kissmetrics Cohort Report to discover whether people upgrade to a paid plan, when they do so, when they refer others, etc. We know we want to acquire more enterprise customers, so let’s find out how the ones we currently have found us. We don’t have to leave Kissmetrics to get this data. It’s all in the People Search. This is how our criteria looks in People Search. 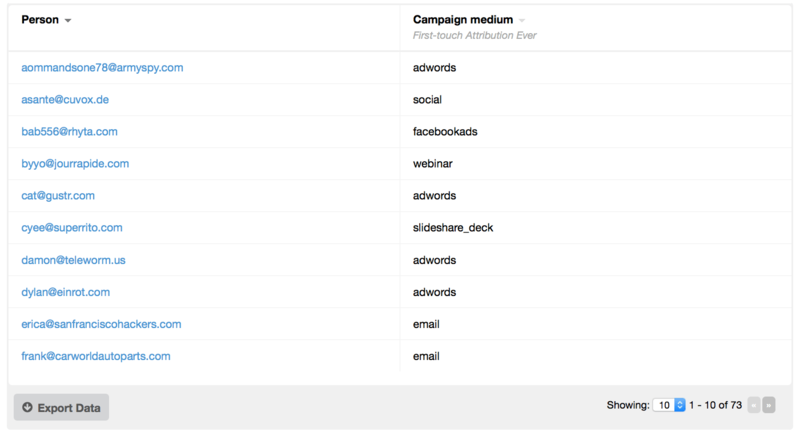 If we’re using UTM’s, we’ll use the “campaign medium” parameter. And we get a list of customers in the enterprise plan. We’re looking at only 10 of the 73 customers. We can export this data to a CSV or just expand our view to get the full list. From viewing the first 10, we can see that many of them came from AdWords. We’ll have to look at the full list to know if AdWords represents the majority. If it does, we know that our AdWords campaigns are working, and we can ramp those up by increasing our budget. We certainly don’t require it, but it’s a good idea to start using UTMs to track your campaigns. 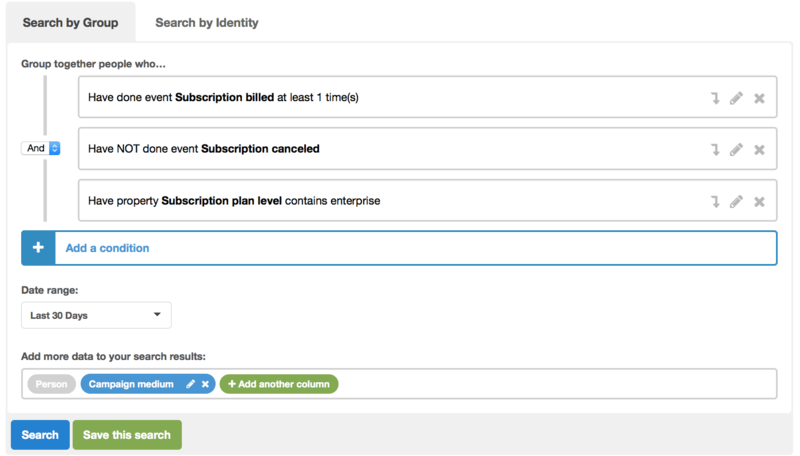 Kissmetrics tracks channels out of the box, allowing you to see how each is performing. If you use UTMs, Kissmetrics will automatically pick those up, and you can segment your data with any UTM parameter. That’s it! Once you get these things, you’ll be on your way to making better marketing and product decisions. We used two Kissmetrics reports to get this data – the Revenue Report and the People Search. Wanna learn (and see) more about them? Just click the Play buttons below. We’ll start with the Revenue Report. To start using Revenue Report, People Search, and the others in our suite of reports, sign up for a 14-day free trial of Kissmetrics. You can also request a personal demo to see how Kissmetrics can work for you. Not ready to sign up or experience a personal demo? No worries, we have a Demo site set up where you can get an overview of how Kissmetrics works.